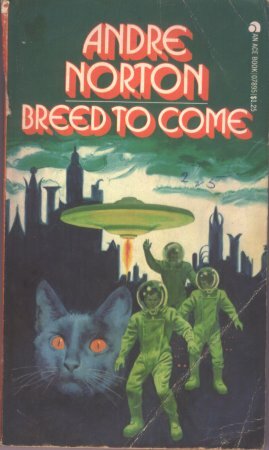 Andre Norton is my kind of author. She's written a bazillion books, I'm sure all of which are entertaining. She loves cats and she spent a good deal of her life with a congenital physical illness that kept her in a lot of pain. I have a lot of respect for her in that her response was to just produce. She's a female sci-fi author who seems quite interested in the civilizations that would arise after we destroyed ourselves. This book is about a future where humans are gone from a planet because of a self-created plague. It is told from the point of view of a society of cats who've evolved into sentient beings. They consider the humans demons from the mythological past. However, one of the cats has started to delve into the human's old dwelling places, teaching himself how to use their tools and he begins to suspect that some of the humans left the planet and may be returning. It's a cool idea and her conception of how housecats evolve into a society is well thought out and entertaining. The book moves along briskly and is compelling to the end. I could have gone for something a little more drawn out and in depth, but this is a pocket sci-fi and novels in this genre have been designed to end quickly. It's a good fun read and I recommend it.